Eng. Wije Ariyaratne (Ari) is the current Director Bridges & Structures at the NSW Roads and Maritime Services. He is responsible for managing the technical risk of over 5950 bridges in NSW under RMS jurisdiction with an asset value of over $18.5B and also developing, retaining and transferring engineering capabilities of 100 staff. He is also an adjunct professor at the University of Technology Sydney and has worked on a number of research projects with the University of New South Wales (UNSW) Sydney, University of Technology Sydney (UTS), University of Sydney (US) and Western Sydney University (WUS). Ari’s story is one of commitment, dedication, curiosity and inspiration. Whilst his achievements speak for themselves, Ari never failed to remember the people that guided and supported him along his five-decade journey as a professional civil engineer. Ari’s journey as an engineer began at the University of Ceylon in the 1967. Having completed his first two years in Colombo, Ari moved to Peradeniya to finish the last 2 years of his undergraduate degree in civil engineering. Ari’s first job as a graduate engineer was with the Colombo Ports Commission in Colombo. Starting his career as an assistant resident engineer, Ari had the opportunity to work with Sri Lanka’s renowned engineer Dr. A.N. S Kulasinghe. Ari’s own feats within the Ports commission came along a little later after he moved to the Galle Harbour. It was under Ari’s tenure that the 1st ship was brought into the Galle harbour alongside the newly constructed quay; until then, ships have been unloaded in the middle of the harbour with the aid of smaller boats. His work resulted in a massive increase in the efficiency of the harbour. Whilst this was just the beginning, Ari’s determination to make existing infrastructure more efficient has followed him throughout his career in Australia which ultimately awarded him the most prestigious NSW State Premier’s Award. Today we know Ari as the man in charge of the NSW State bridge network. What many of us don’t know is the first bridge he helped to build was at Mahamodara, Galle in Sri Lanka. Little did he know then, that a few decades later, he would become a world class expert in the field of bridges? Ari migrated to Australia on the Christmas Eve 1971. The warm summer and the festivities meant companies were closed. During our conversation, Ari said “I remember wondering if I had made a mistake. I left a good job in Sri Lanka for a new start here and there was no work to be found”. However, Ari’s story is one of commitment. After a few initial setbacks, Ari walked into 309 Castlereagh Street, Sydney the then head office of the Department of Main Roads and enquired about a job. A week later, Ari got a telegram with some good news. They wanted Ari to join the team that designed the King’s Cross Road tunnel, which was Sydney’s first cut and cover road tunnel. A recently immigrated young engineer Ari added another badge to his portfolio of firsts! By 1983, Ari had designed a number of bridges which hundreds of thousands of commuters use in the present day M4. However, one of many that boosted him as a true champion within the present-day RMS was the Pymble interchange project. The Pymble interchange project was running late and Ari was called on to help accelerate its delivery. Under his leadership, the project was accelerated and delivered on time. This success and his design experience catapulted his career within the RMS and soon after he was appointed as the Supervising Engineer Design (Bridge Branch) and was responsible for the design of bridges in the Northern half of NSW. On the 7th of November, Eng. Wije Ariyaratne won the 2018 NSW State Premier’s Award for “Delivering Infrastructure”, but the journey towards this moment was nearly two decades long. Eng. 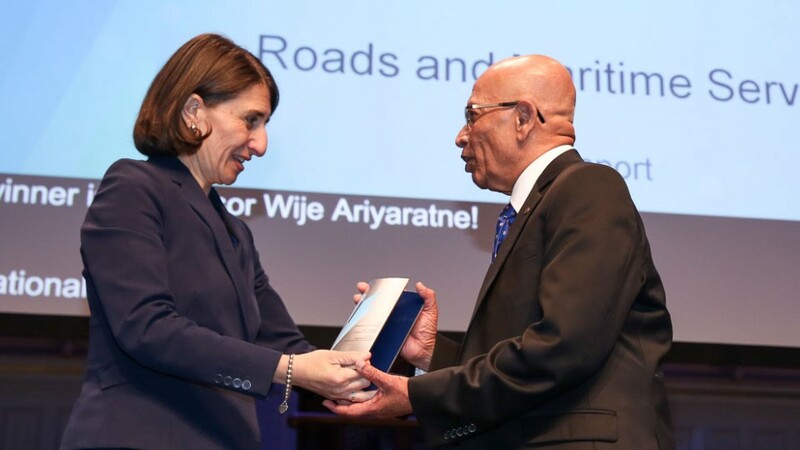 Wije Ariyaratne receives the Premier’s award from NSW Premier Gladys Berejiklian. In 1995, the Road Traffic Authority (RTA) restructured and in doing so identified Bridge Performance Testing as a key focus area. At the beginning of this article, I mentioned Ari’s journey was one filled with curiosity. Ari approached his then manager Ray Wedgewood and expressed his interest to work in this area saying, “I’m not an expert on bridge performance testing Ray, but I like a challenge as this seems to be a very interesting one”. With an attitude like that, it shouldn’t surprise us that he was picked to be the manager for this section. Why was Bridge Performance Testing a Key Focus Area of the RTA? During our conversation, Ari explained that over 600 important bridges in NSW were built before 1948 and had been designed to carry low loads of 16 tonnes and everyone in the field at the time believed the loads can’t be increased without doing additional work on them or replacing them. Even Ari and his only staff in the team then Rod Oates were at a crossroads when 3 independent consultants concurred with the status quo. Ari challenged the status quo, and that is what makes him a true genius. Basing his work on a Canadian model, Ari pioneered Bridge Proof load Testing Facility in Australia to test bridges perceived to be under capacity to carry higher loads. Within a couple of years, representative samples of all 600 odd bridges. Using the results from those results, all 600 bridges were cleared for higher loads with confidence, thanks to the testing procedures. The alternative would have cost the state coffers billions for bridge upgrades and replacements that weren’t necessary. Ari considers the Premier’s award to be the pinnacle of his professional career but he is certainly not a one-show pony. Ari’s work as the chairman of the committee reviewing the Australian Bridge Standards (AS-5100) is one of another proud achievement. Further, he spearheaded running the RMS Annual Bridge Conference which he started in 2006 with 80 delegates from NSW, expanding to over 300 delegates across Australia in 2018. Ari is especially excited about the 2018 conference happening a little later this year with the theme “Smart Technology for Bridges” which he has identified as a growth area in his profession. Ari has developed a number of technologies together with UTS, UNSW, US and WSU. This year in collaboration with WSU he and his team have developed drones to remotely inspect bridges more cost effectively and safely in order to maintain the well-oiled network of NSW bridges. Reflecting upon his 50-year career as an engineer, Ari asked all young engineers to “Be able to take a challenge, to be able to work effectively in a team but also be able to self-motivate and to ask the right questions at the right time”. Interview conducted by Eng Buddhi Ranasinghe with Eng. Wije Ari on 27th November 2018.